It's only fitting that my 100th post coincides with me writing about a fabulous sustainable ensemble I created for . . . myself! Last weekend I went to the wedding of a couple of dear friends in a lovely natural setting in Royal National Park. The invite called for guests to dress in 'garden formal'. I was thrilled with the brief and in love with the look I pulled together. I can definitely see myself wearing this again for another wedding, a girls outing or even the races. waiting at the bus stop to get a lift to the Manly ferry. I love public transport! my measurements - a good tailor is worth a million bucks! 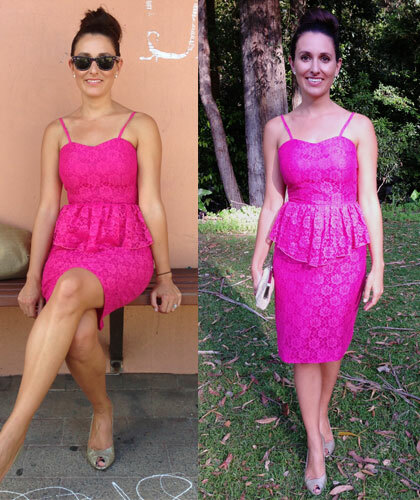 The dress: Dear Gladys (with some help from Lucy's Alterations in Sydney's CBD - perfection!) I nearly shrieked with glee when I saw this vintage dress with peplum - sustainable and on trend! An eco-fashionista's dream come true! The earrings: Vintage, from my husband's grandmother Anne who passed away last year. She loved a party, so I know she'd be thrilled to have me wearing these to a wedding. Although attending formal events may seem like the perfect opportunity to splurge on a new outfit, I find it's so easy to make these looks sustainable because there's just so much opportunity for creative reuse and borrowing. Anyway, enough about me. The most important thing about the event was celebrating the bride and groom.